Fans are devices we can use on a regular basis around the home and so it’s only natural that they should be smart. BOND has made it really easy to turn your existing RF fans smart. In this BOND fan control review, we will show you what it’s like to set up and use it. 1.4 Is BOND Worth It? Getting starting with the BOND is just a few simple steps. First, you have to download the BOND app. There is both an iOS and Android app. Then, like most standard smart home devices, it walks you through connecting the BOND to your WiFi. Next, it will have you connect your fan by using your fan remote. For us, it found our fan controls right away and were able to start testing out the buttons to make sure the BOND could control the fan. It did give us two dimmer buttons which threw us off because one of them worked and the other didn’t. The app allows you to remove buttons so it wasn’t a problem to just remove the button that didn’t work. The BOND app keeps things simple which is good because it doesn’t need to be overly complicated. When you open the app it shows you the fans you have connected already. Clicking on a fan will bring up the controls to turn on the fan or change its speed. There was almost no delay when using the app and it felt just as fast as using the remote to the fan. Since the fans use RF (radio frequency) the BOND doesn’t have to be in the same room as the fan. 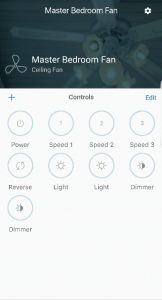 In our BOND fan control review we set up the BOND in a room central to our house and it was able to control 5 different fans around our house. Metal walls can stop the signal but we have it going through multiple walls with no problem. We were also able to put the BOND in different locations around the room and it worked fine. So it can be on a shelf or somewhere not out in the open for it to work. BOND smart home features are pretty good out of the gate and are only going to get better. 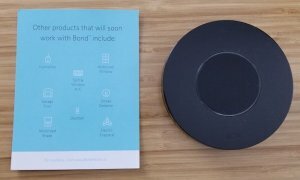 Currently BOND is compatible with Alexa and Google assistant. If you currently have a fan that can be controlled with a remote you know how nice it is to not get up and turn on the light or fan. However, the fan remote always seemed to be far away when sitting on the couch. 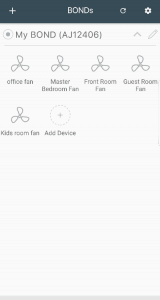 Being able to use Alexa or Google assistant to turn on the fan is much more convenient. When using Alexa to control the fan, BOND had no problem turning the fan on and the light on. If your fan supports different speeds, you can tell Alexa to change the fan to 10% for the lowest speed, 50% for the 2nd speed and 100% for the highest speed. 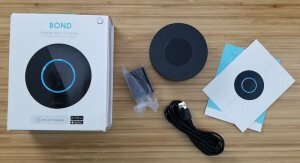 Setting up BOND with Alexa was just like adding any other device to Alexa except for one little thing. I named my device in BOND “office fan” but when it added the connection in Alexa it created two devices, one was “office fan” and the other was “office light”. I expected it to be named “office fan light” but once I figured it out it wasn’t a problem for the other fans. We were not able to dim the lights with Alexa. Our fan remote light button has to be held down for the lights to dim so it makes sense that dimming the lights with Alexa wouldn’t work. 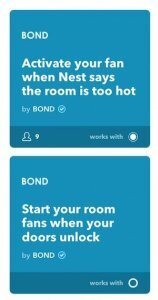 BOND is currently compatible with IFTTT. With IFTTT you can have BOND turn on your fans when your smart thermostat reaches a certain temperature. You can also have BOND turn on the fans when the weather outside gets too hot. This can be a money saver since it’s cheaper to run the fans than the AC. One thing to note is that you won’t be able to have BOND automatically turn on your fan light reliably. The fan light signal to the fan is typically the same and it just toggles the light to the opposite of what it currently is. So BOND might turn off your light when it’s getting dark because the light was already on. But the BOND app does work remotely so you can control your fans when you’re out and about. Since BOND uses RF an IR to control devices, there are many more devices BOND hopes to control in your house. The idea of being able to close my garage door if I accidentally left it open with no extra hardware is awesome. Anything else you use a remote for around your house might be able to be controlled by BOND. 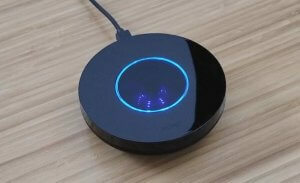 The device will also be compatible with SmartThings, which will take the BOND smart home features even further. You could have it turn on the fan when the SmartThings motion sensor detects motion and the motion sensor’s temperature is too hot. This will be similar to the more expensive Haiku Fan that we reviewed. If you have at least 2 RF fans in your house then BOND is definitely worth it. Even if you only have one fan with a remote, the BOND is still worth getting. The other alternative to BOND is a smart light or fan switch. We have installed a few of these around our house and they can be pricey. If you buy smart light and fan switches for more than one room, you are looking at paying much more than the price of the BOND. It’s also way easier to install. BOND says they will be adding devices in the future so you will be able to control more than just fans. We have been using the BOND for over a week now and we have had zero issues with it so far. Let us know if you have any questions about this BOND fan control review.